Numerology is the study of numbers and Alphabets and their use in daily life. Numerology is the study of the occult meaning of Numbers and alphabets and their influence on human lives. As a Numerologist , I Begin with your name and birth date. They are the database which provides an insight in your life . It is Important to understand that the actual purpose of numerology is not to predict the future, but Numerology is used to provide you with keys to explore and discover your own potentials and destinies based on your date of birth and destiny number. 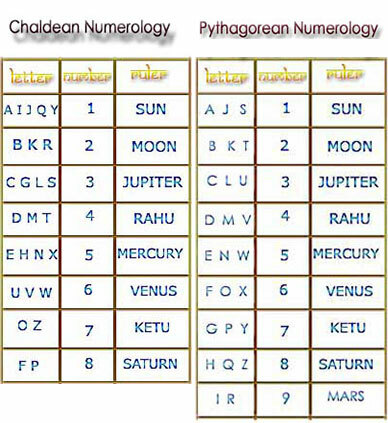 To calculate the numerological value of a name, each letter in the name is converted to its number using the table besides and then added together. The resulting number is reduced to a single digit by adding its digits together. As per Numerology there is a Strong relationship between numbers and Alphabets , and as per Name Numerology we understand that that the number value of a person's name plays a significant role in their destiny and relationships. Each number has certain characteristic or behavior pattern associated with it. As per Name Numerology we believe that you can give your child a great start in life by choosing a Numerologicaly correct name that reflects the positive qualities associated with your Childs date of Birth . If the New born babies are given names as per numerology this ensures positive vibrations for the baby right from the start and throughout his /her lifetime. Natural leader, self-sufficient, ambitious. Avoid extremes of bossiness, shyness. Too impulsive. Standing out from the crowd. Trying new ideas. Political leadership, celebrity, or small business owner. Loving, peace- maker, analytical, ideal partner. Hanging back, not speaking up. Stuck on details, lonely. Finding the right relationship. Needs harmony, order. Diplomatic corps, counselor, partner in small business. Outgoing, joy of life, imaginative, enthusiastic. Fears routine. May lack self-discipline, accomplish little. Energy and ideas in action. Having a good time. Press secretary, party planner, small business promoter. Works hard, practical, gets things done. Fears downsizing, not having familiar routine. Rigid. Need for security. Develops order out of chaos. Administrator, team player, back office of small business. Bold, daring, and persuasive. Enjoys the finer things. Restlessness to the point of boredom. Easily side-tracked. To search for new opportunities. Take chances. Try it all. Public figure, media, develop new idea for small business. Warm, nurturing, and happily dom- estic. Reliable. May end up feeling like a doormat. Can be too opinionated. Taking care of loved ones. Finding safety, comfort. Personal assistant, educator, or caterer to small business. A deep thinker, spiritually inclined. Unique, eccentric. Too aloof and fears not living up to high standards. A loner. To seek answers to life's questions. Observe. Discover. Analytical field. Or self-employment in small business. Decisive, forceful, good with money. Accomplished. Often lacks feeling for those who stand in the way of goals. To strive higher, take control, seek power, status. Professional field, or operator of small business franchises. Inspired, intuitive, creative. Seeks to improve the world. Needs to avoid bad habits, and attend to life's details. To see the "big picture." To dream the dream. Community leader, organize small bus- iness owners.